Being a pet owner your biggest concern is that your dog remains free of any and all dog disease that affects dogs all over the world. Any suffering that you notice in your loved dog can cause you to suffer. Ringworm disease in dogs is a disease that shows obvious and visible signs of pain and suffering for your dog. The name ringworm indicates the presence of worms that cause the disease this is an ancient concept which has been disproved by use of latest veterinary medicine. The fact is that the ringworm disease in dogs is caused by a fungal infection and not by a worm. There are several types of fungus that cause the ringworm disease in dogs, the disease is also known as “dermatophytosis”. 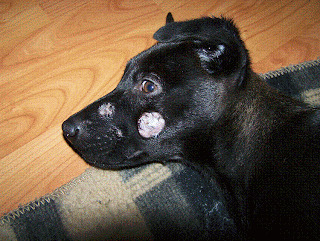 Circular lesions on the dog’s skin generally indicate ringworm disease in a dog, not all dogs will show this sign, some dogs will have lesions of a different shape making it quite difficult to identify and diagnose the disease, as these lesions can be mistaken for some other skin disease in dogs. Ringworm in dogs usually shows physical symptoms and the dog suffers discomfort on account of these symptoms. Almost every dog has a possibility to be affected by ringworm and this dog disease is not limited to a specific geographic region, since it is a fungal disease it can affect all breeds of dogs all over the world. The disease in more common in hot and humid environments since it affects the skin of the dog. A dog with a weak immune system is more likely to suffer from the disease so young dogs and puppies are more prone to the disease. Ringworm is a skin condition caused by a fungal infection this dog disease can be transmitted to other animals by several ways, the most common being contact between dogs. Any sort of contact with infected hair, dead skin, or other materials that have been near an infected dog can cause the transmission of the disease to other dogs. Ringworm in dogs can sometimes be difficult to diagnose because it has many symptoms that are also present in other skin conditions for example dry skin in a dog or an allergic reaction to pain, chemicals or some other household goods. Here are the most common symptoms of ringworm in dogs, skin pustules, skin lesions, regular itching, and a prominent red, scaly skin. If you notice any of these symptoms consult a vet and start treating your pet immediately. Ringworm disease in dogs is quite easy to treat and the vet will advise you as to the best way of treating this ailment. Topical treatments like creams, lotions and antifungal shampoo will generally solve the problem, and since this disease is caused due to fungal infection the vet can also advise you to give your dog oral medication to treat the disease, some effective medicines used to treat this condition are, Griseofulvin, Ketoconazole and Itraconazole. Let the veterinary decide the best course of treatment for your dog, and you will see your dog's health improve fast.